This can’t miss, nearly $4 million dollar sale features over 770 lots of merchandise, many fresh to the market and offered without reserves. 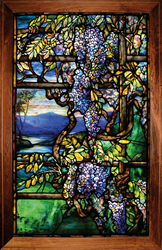 Lot 1365: Tiffany Studios leaded glass Wisteria window, estimated at $100,000-150,000. James D. Julia Auctioneers is pleased to announce its highly anticipated, annual early summer Lamps, Glass, and Fine Jewelry sale. This auction includes remarkable examples from collectible brands including Tiffany, Daum Nancy, Lalique, Loetz, Handel, and Pairpoint, among many others. The auction starts promptly at 10am on June 16th at the company’s Fairfield, Maine gallery. Previews will be held June 15th from 9am to 5pm, June 16th from 8am to 10am, or by special appointment. This gem of an auction kicks off with 60 lots of important jewelry, including fantastic selections of rings, earrings, bracelets, and necklaces. Many pieces are from an extensive, unreserved Texas Estate which also includes outstanding Tiffany Studios lighting and both French and American decorative art glass items. If bling’s your thing, then lot #1020, a Cartier ring centered by a 1.98ct diamond, will leave you speechless. This 18kt yellow gold and platinum ring features a VVS1 clarity and F color diamond and two well matched, rich, deep green emeralds and is estimated at $20,000-30,000. 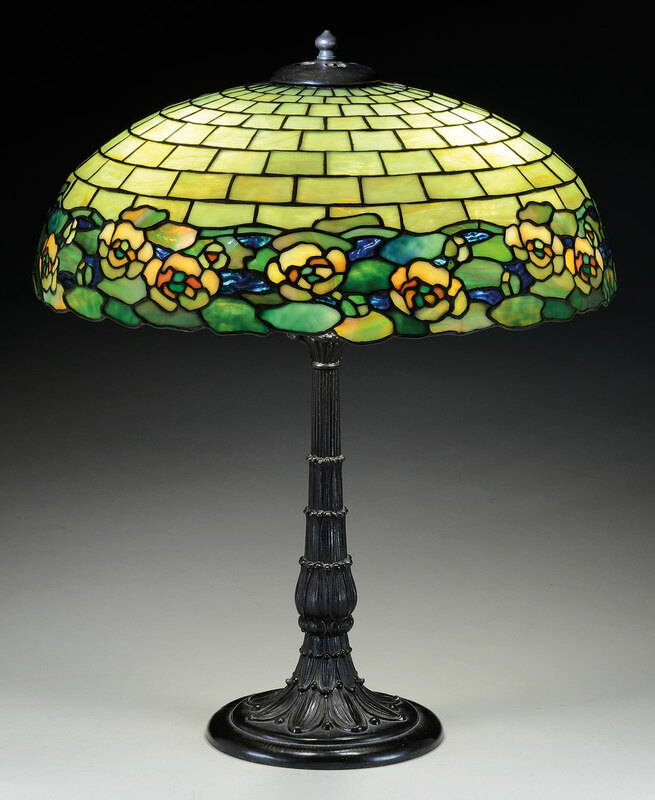 Collectors are certain to light up over this sale’s amazing offering of extraordinary Tiffany lamps and chandeliers, many from the same unreserved Texas Estate. Two examples in this category deserve the spotlight. The first, lot #1099, is an outstanding Tiffany Studios dragonfly chandelier. Each dragonfly has a blue body, red eyes, and striated wings, set against a background of dichroic rippled glass and finished with amber and green cabochon glass jewels. It is estimated at $100,000-150,000. The second, lot #1108, is an impressive, possibly custom-order Tiffany Studios dogwood floor lamp with a massive 32” diameter shade. This fantastic rarity blooms with an all-over dogwood design with multi-colored confetti background and an unusual and eye-catching irregular floral lower border. This monumental and extremely rare example is estimated at $100,000-150,000. Perhaps the most incredible of the Tiffany on offer is lot #1365, an exceptional Tiffany Studios Wisteria window. Wisteria, given its intricate form as well as fantastic coloration, is one of the most desirable Tiffany Studios lamp and window patterns. This eye-popping example blossoms with multi-colored purple and blue glass, confetti and striated glass, a back painted panel of striated amber glass, and a red glass panel - all carefully layered to create great depth in the window presentation. It measures 31" w x 47-3/4" tall overall including its wooden frame. This breathtaking treasure - featured on the back cover of our auction catalog - is conservatively estimated at $100,000-150,000. From the unreserved estate of Lynda Cunningham, of upstate New York, comes an impressive and diverse offering of fantastic Tiffany Studios metalware and candlesticks. One of many highlights of this group is lot #1183, a fine Tiffany Glass and Decorating Company peacock mirror. This rare, period example is the smaller version produced and is in outstanding, like new condition. 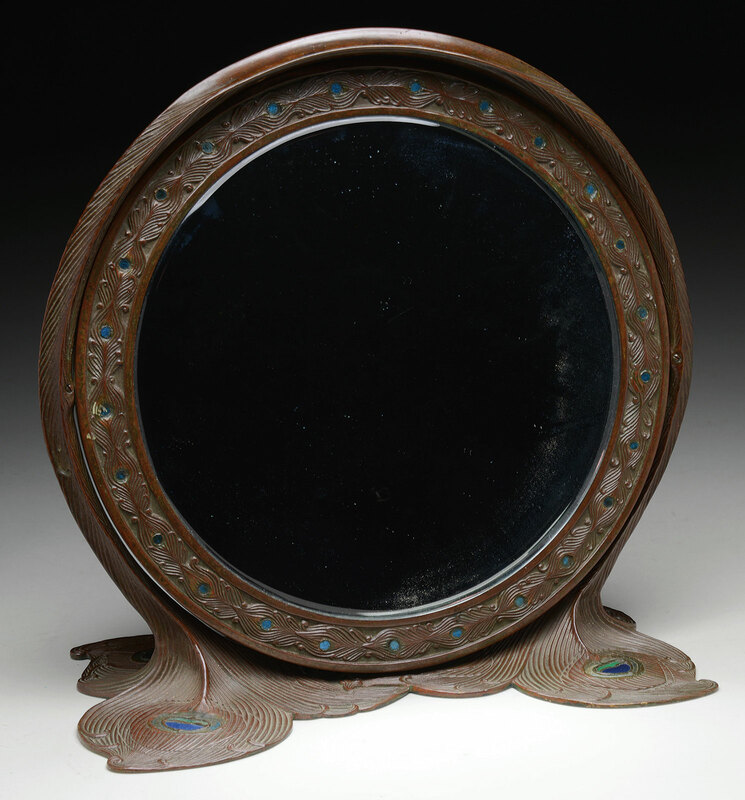 It features a cast bronze frame with a peacock feather design enhancing the base and back of the mirror, along with a stylized floral design framing the mirror. The eyes of each peacock feather are set with iridescent Favrile glass inlays. Circles throughout the stylized floral border are also set with small discs of blue iridescent glass. This extraordinary example reflects the finest of the Art Nouveau period and is offered at a very attractive $2,500-3,500 estimate. Also perfect for a lady’s dressing table is lot #1488, a Webb cameo owl perfume scent bottle. This early example, with 1885 hallmarks, is decorated with a detailed wheel-carved owl resting on a branch among leaves of an English Oak tree, all set against a clear and internal red background. The quality of this piece, along with the rarity of its theme, make it a wise choice for any bidder interested in early English glass. This bottle, complete with its clear glass stopper and sterling hinged collar and cover, is estimated at $10,000-20,000. French art glass makes a strong appearance in this sale. A number of museum-quality Daum Nancy vases highlights are certain to capture the imagination of collectors both here and abroad. The first is from the well-curated Rudd Collection of Chicago, IL. It is lot #1516, an exceptional Daum wheat vase decorated with cameo carved and enameled wheat stalks set against a mottled purple shading to white background. This “field of dreams” vase is further detailed at the foot with a stylized Art Nouveau cameo pattern and gilded highlights. Estimated at $15,000-20,000, its provenance also includes the Pinhaus Collection from Los Angeles CA. Another Daum highlight is lot #1606, an important and desirable dragonfly cameo vase. This 8-1/2” tall example has a mottled green and yellow glass cameo decoration of flowers, stems, and leaves against a mottled light blue background with an applied dragonfly. This outstanding vase with its highly sought after theme, it will certainly take flight with its $12,000-15,000 estimate. The last Daum Nancy highlight is by no means the least. Lot #1596 is a very desirable 13” tall cameo snail vase. Estimated at $17,500-22,500, this exceptional piece features an acid cut grapevine pattern in bright vitrified colors against an internally decorated yellow, pink, orange, and amethyst mottled background. The vase is detailed with applied glass grapes in the clusters and two applied and wheel-carved snails in all original, correct condition. Also in the French glass category from a later period are several lots of Rene Lalique glassware. Not to miss in this grouping is lot # 1638, a Rene Lalique Tourbillons vase decorated with deeply impressed swirls and black highlighting; this handsome example is estimated at $7,000-10,000. This auction’s selection of fine American and European table lamps is truly electrifying. It’s the best of both worlds with lot #1637, a signed Loetz/Gurschner table lamp. This rare lamp has a Loetz art glass shade decorated with blue swirling lines and platinum oil spots against an orange iridescent background - and a bronze decorative base by Gurschner. It is estimated at $6,000-8,000. Lot # 1702, a Duffner & Kimberly table lamp, features pastel yellow, orange, and green glass hyacinth flowers and leaves against a highly textured blue background simulating water. Its irregular border, created by petals and foliage, is particularly appealing. It is estimated at $10,000-15,000. Quality reverse painted lighting is led by lot #1685, a signed Handel reverse painted underwater lamp. This example is detailed with a painted shade featuring an underwater scene with fish swimming through aquatic vegetation against a shaded green background. It rests on an original Handel mermaid base and is estimated at $30,000-40,000. And there’s certain to be bunches of interest in lot #1697, a signed Pairpoint puffy grape table lamp. It features a blown-out shade with clusters of red grapes set against green, yellow, and orange grape leaves. The shade rests on its original Pairpoint base, with grape leaves and vines surrounding the foot and grape clusters hanging from the vine shaft. It is estimated at $9,000-12,000. Fine contemporary glass windows, vases, paperweights, and decorative items add a splash of modern color to this auction. Lot #1723, a signed Stelz Studios leaded glass window is a literal garden of Eden. It is estimated at $6,000-8,000 and features red roses and green mottled leaves climbing along a yellow and green striated trellis, all against a blue, purple, cream, yellow, and brown background. The window is plated with random confetti panels on both the front and back and housed in a wooden door frame. It measures 24-1/4" x 79-1/2" overall. This item is one of a pair, with the second matching window, Lot #1724, also available in this sale. This comprehensive auction rounds out with highly curated selections of Art Nouveau furniture, pottery, and fine decorative art items. Furniture enthusiasts are certain to gather around lot #1499, a fine Majorelle Art Nouveau walnut banquet table in the Wheat motif and featuring a rectangular top and tapered, carved legs ending in square pad feet. Estimated at a reasonable $4,000-$6,000, it can be extended with five original table leaves, also included in the lot. For those looking for a complete dining room, other complementary patterned Majorelle furniture pieces, including chairs, are available through this sale. Our final highlight is lot #1653, from the Austrian Art Nouveau Amphora genre. This nearly 14” tall Eastern Dragon baluster vase is decorated with a bronze colored 'wrap-wing' dragon with gold highlights, set against a mottled background and finished in an iridescent glaze. The workmanship and quality of this piece is so exquisite that you can see each individually formed sharp dragons tooth in his mouth! This signed vase is estimated at $6,000-$8,000. James D. Julia, Inc., one of the top ten antique auction houses in North America, is headquartered in Fairfield, Maine. The company also has an office in Boston, Massachusetts. In business for over 40 years, the company conducts high-end antique, collectible, and decorative arts auctions throughout the year. Julia’s routinely establishes new world records through its auctions. Julia’s has three divisions, including Rare Firearms and Militaria; Fine Art, Asian and Antiques; and Rare Lamps, Glass and Fine Jewelry. Each division is staffed by knowledgeable professionals and is internationally recognized and respected. 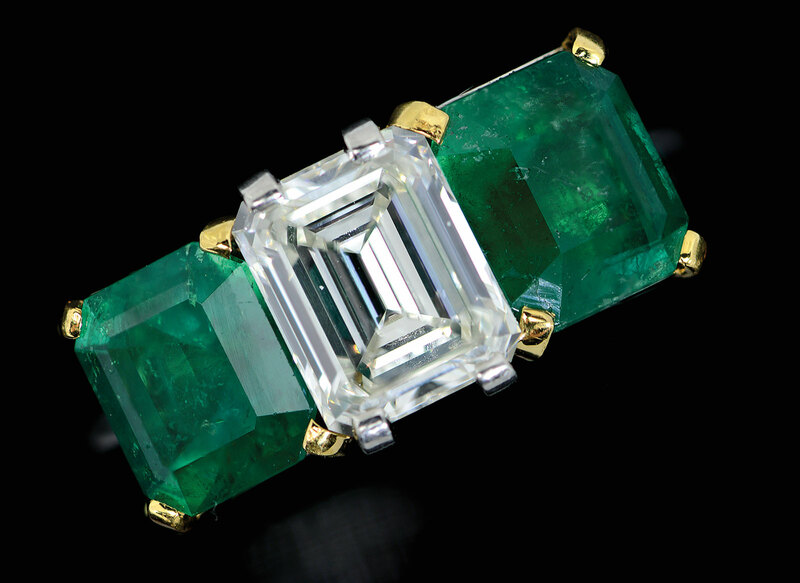 Lot 1020: Cartier emerald and diamond ring, estimated at $20,000-30,000. 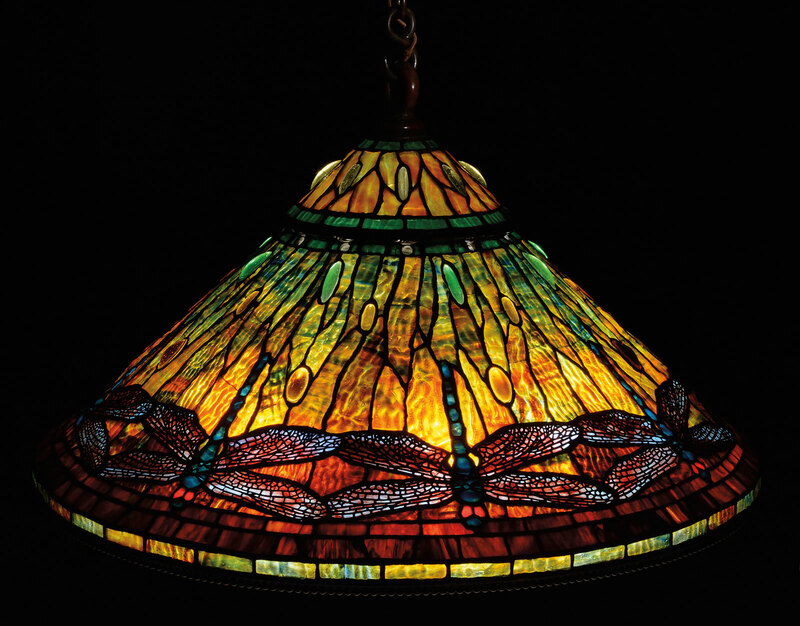 Lot 1099: Tiffany Studios Dragonfly chandelier, estimated at $100,000-150,000. 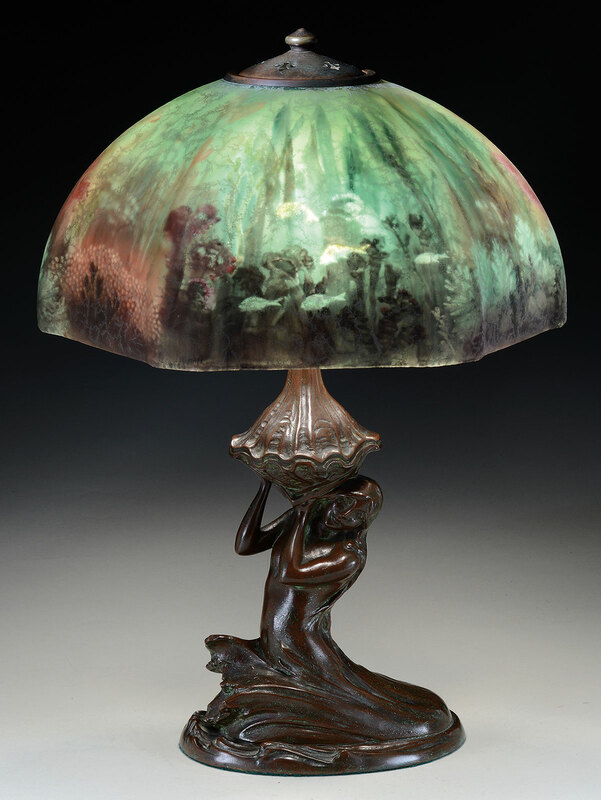 Lot 1108: Tiffany Studios Dogwood floor lamp, estimated at $100,000-150,000. Lot 1183: Tiffany Glass & Decorating Company peacock mirror, estimated at $2,500-3,500. Lot 1488: Webb cameo Owl perfume bottle, estimated at $10,000-12,500. Lot 1499: Majorelle Art Nouveau walnut banquet table, estimated at $4,000-6,000. Lot 1516: Daum Nancy cameo and enamel Wheat vase, estimated at $15,000-20,000. Lot 1596: Daum Nancy cameo Snail vase, estimated at $17,500-22,500. Lot 1606: Daum Nancy Dragonfly cameo vase, estimated at $12,000-15,000. Lot 1685: Handel reverse painted underwater lamp, estimated at $30,000-40,000. Lot 1702: Duffner & Kimberly Water Hyacinth table lamp, estimated at $10,000-15,000.